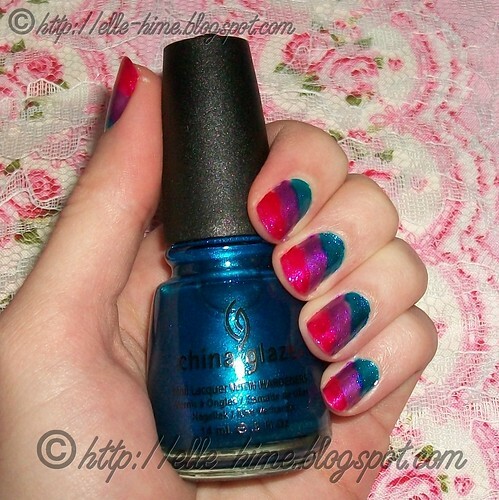 Princessly Polished: NotD: Rainbow base for art - first try! Last night after work my nails were in sad shape. The lacquer on them was chipping, I had broken a nail at work, and I needed to correct that. Finally I'm feeling well enough to paint my nails again! 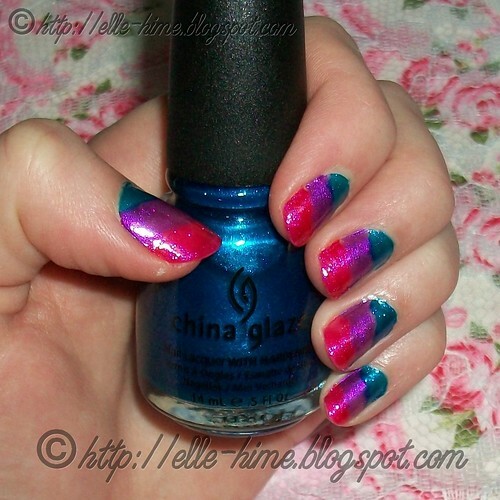 At first I was thinking of doing OPI Mermaid's Tears as a simple mani... but... I've been looking at colors like that come out of my nose for the past few days, so... (Sorry.) Instead I wanted something lovely and vibrant! Inspired by the tutorials of doing a design (crackle, stripes, animal print) over a rainbow of horizontal stripes, I wanted to make it my own. I've never tried doing horizontal stripes, as far as I can remember. I'm usually not that ambitious.... So, I grabbed China Glaze in 108 Degrees, Senorita Bonita, and Blue Iguana. These are gorgeous glass-fleck shimmer polishes. When there isn't a bright flash you don't really notice the spots where the polish wasn't as thick. I could have made it more opaque by doing a creme base color first, but again, I was planning to just cover this. I'm so glad I bought these polishes. They have so much beautiful shimmer locked in them. 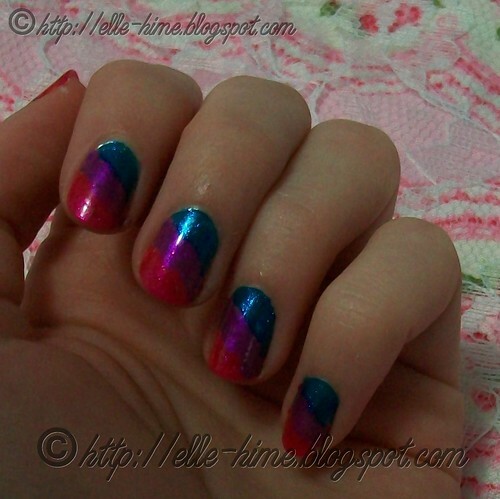 It reminds me of bright-colored glass or hard candies on my nails. =) I might eventually have to get the rest of the collection some day... And since today is another rainy grey day, I am glad I opted for vibrant nails last night. These are going to make me smile all day! For my first try at this type of design I'm really pleased with them... sometimes less is more! Tell me, how often do you start a nail art design just to stop before it's completed because you like what you have so far? Great job! I love them. I wouldn't have covered them either. Blue Iguana is one of my favorite blue's! Rainbow and sparkly, I love it.